Cell surface receptors are located within the cell membrane. These molecules are specific components of the cell membrane, which transmit information from the outside the cell through the cell membrane phospholipids to inside the cell. 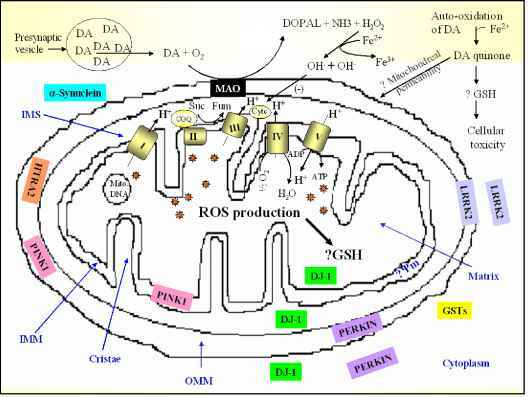 Chemicals, as well as sensory modalities, can cause the activation of specific membrane receptors. This process may involve the binding of a drug to chemical groups on the part of the receptor located on the outer surface of the cell membrane, forming a drug-receptor complex. If the chemical is an agonist, the formation of this complex will cause specific changes in the conformation of the receptor that can trigger biochemical changes inside the cell. For example, the conformational changes resulting from the drug-receptor interaction may cause an ion channel to open, leading to a change in ionic flux across the membrane. The activity of enzymes may be regulated by the influx of ions. The conformational change in the receptor promotes the interaction of the receptor with a G protein found on the cytoplasmic surface of the cell membrane. G proteins, which are named because of their interaction with guanine nucleotides (GTP), provide a link between the drug-receptor interaction and the cellular response. Changes in G proteins, as a consequence of their interaction with a stimulated receptor, may activate certain enzymes, thereby enhancing specific chemical reactions within the cell. G proteins can regulate ion flux as well. In summary, cell membrane receptors are macromolecules, usually composed of protein, which are located in the cell membrane and which contain various domains or regions that can interact with extracellular chemicals, such as hormones and neurotransmitters, and intracellular molecules, such as G proteins. In some cases the receptor itself may be an ion channel that spans the cell membrane and regulates the entry of ions into the cell. An example of the latter is the nicotinic receptor that regulates sodium entry into skeletal muscle. Many organs contain more than one type of receptor within their membranes with the number and proportions of the receptor types varying among different tissues (See Figure 1). Figure 1. Diagram of a cell with its membrane containing various receptors. Some receptors for neurotransmitters are linked to G-proteins. 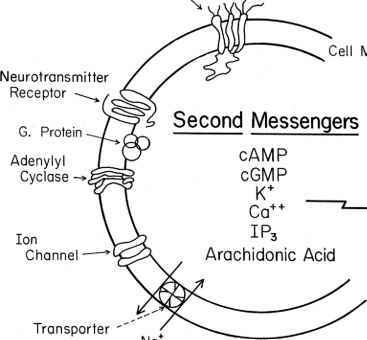 The interaction between the activated receptor and G-protein results in the activation or inhibition of intracellular enzymes that alter the rate of synthesis of second messengers within the cell. An example is adenylyl cyclase, an enzyme which catalyzes the formation of the second messenger, cyclic AMP. These second messenger molecules are important in the regulation of specific chemical reactions within the cell. Some receptors regulate the opening of ion channels. When these receptors are activated, ions pass through the channels down an electrical or concentration gradient, crossing the cell membrane. Transporters can complex with ions or molecules and transport them across the cell membrane. Certain cells in the body contain specialized sensory receptors. These transmit information related to such sensations as touch, taste, smell, and light.